Discover contemporary, Christ-centered songs for intergenerational worship that are rooted in the fullness of the Catholic faith. Through his ministry in the Houston area, his national travels and his work with LifeTeen events, Ben Walther has quickly become a well-known worship leader. Marking his spiritandsong.com debut, Make Your Home in Me delivers seven contemporary, Christ-centered songs for intergenerational worship that are rooted in the fullness of the Catholic faith. Ben teams up with producer Tom Booth and engineer Jason Hoard (Third Day) to create a modern worship sound, reminiscent of Matt Redman and Hillsong. From electric guitars and group singers—evoking a congregation—to piano and Ben's uniquely warm and edgy vocals, discover a variety of music for liturgy, Eucharistic adoration and praise and worship. "Christ Is Lord" proclaims the resurrection reality of Christ's lordship over all creation. Presenting the human Jesus—homeless and simple—"Make Your Home in Me" invites him to reside in our hearts. Inspired by the Pentecost liturgy, "The Wonders of Your Love" extends that same invitation to the Holy Spirit to dwell within us. This is the MP3 playlist for the enhanced CD, Make Your Home in Me—featuring FREE chord sheets, song lyrics, instructional videos and more!. 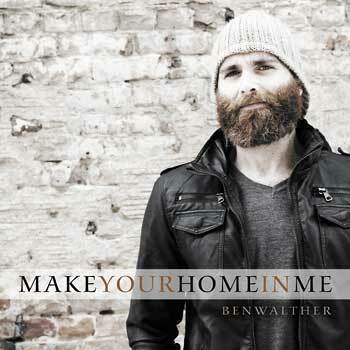 Offering seven contemporary, Christ-centered songs for intergenerational worship that are rooted in the fullness of the Catholic faith, Make Your Home In Me marks Ben Walther's Spirit & Song debut. Ben has teamed up with producer Tom Booth and engineer Jason Hoard (Third Day) to create a modern worship sound, reminiscent of Matt Redman and Hillsong. From electric guitars and group singers—evoking a congregation—to piano and Ben's uniquely warm and edgy vocals, discover a variety of music for liturgy, eucharistic adoration and praise and worship. The enhanced CD provides musicians, music directors and contemporary groups with everything they need to learn, play and share these songs with ease, including chord sheets, song lyric sheets, instructional videos and more!